Despite the restrictions instituted by the 2006 UIGEA (which went into full effect on Jun 1st 2010), there are still online poker rooms out there which accept US players. Some of these rooms are larger, others are smaller, but the bottom line is that together, they represent a viable and diverse alternative for the US based poker public. It doesn’t take a whole lot of research to find the best US poker rooms. The two online poker giants, Full Tilt Poker and PokerStars both continue to accept US traffic, which pretty much means they’re the two best US poker rooms. Our team has put together a selection of smaller sites too, which are quite worth playing at as well. 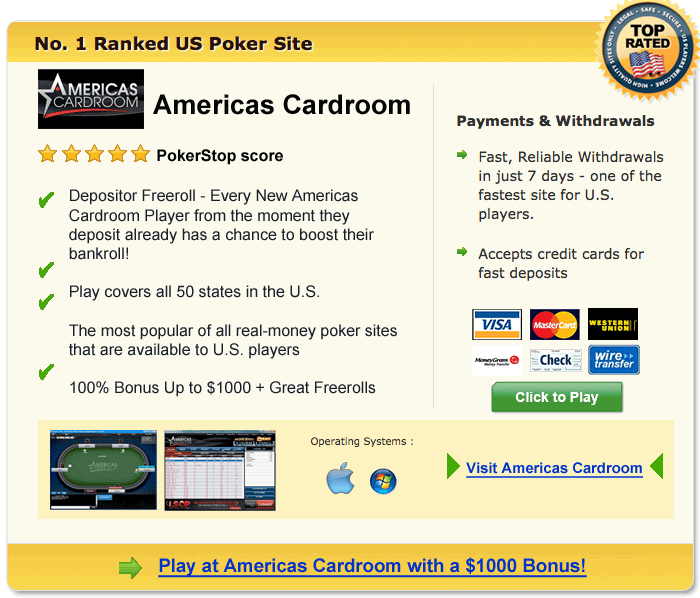 How come these poker rooms can still accept US traffic, despite the UIGEA’s restrictions? The reason is simple: the UIGEA doesn’t actually outlaw poker as a game, rather, it makes it illegal for financial institutions to operate funds transfers to and from online poker rooms and online gambling operations. The best us poker rooms have found a way to transfer funds, without any of the US financial institutions coming into direct contact with them. These solutions have pretty much been embraced by the entire US online poker community already.